After the patch Leviathan seems more attractive than ever with fresh 50% cold to physical conversion. And after all it's a Blademaster weapon, so I decided to make use of it with Blademaster. Clears Crucible in 8 minutes under Vanguard banner. 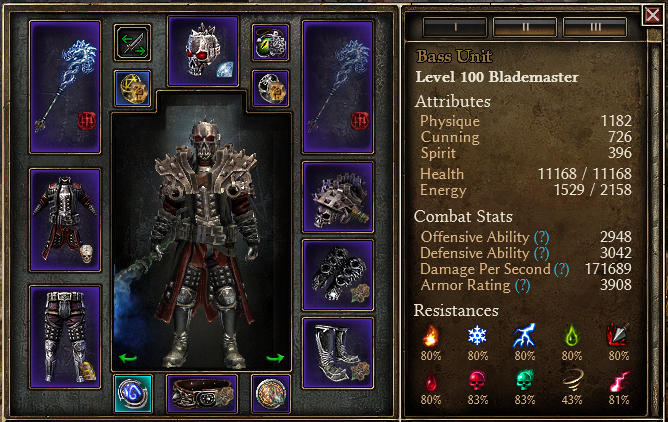 This build shares the thread with Tactician, Commando, Death Knight and Witchblade subvariations. I made appropriate tests and the list of optimal combinations for this build is ready. Death Knight, Blademaster, Commando, Witchblade and Tactician were tested, I made 1-2 runs with each, estimated chances to die and clear times. Tests were performed with 3 buffs and Vanguard banner. Swapped only second mastery and Gladiator's Belt for Death Knight. Build is self-explanatory: Leviathan, Cadence, Warborn, Peerless Eye of Beronath. Straight and simple. Skill tree includes Blitz, transmuted Blade Arc and Ring of Steel as easy AOE nukes. I went Empyrion devotion route because damage-wise it's same as Oleron's, but the safety is much better. Also Harp solves all common problems of such energy hungry builds. Build's defenses include nice amount of health and DA, 3900 Armor and 29% permanent phys resistance, 27% permanent dodge raising to 87% when boots proc is active, RoS for fumble, Will of Menhir, Ghoul and Prismatic Diamond. It's really hard to kill. 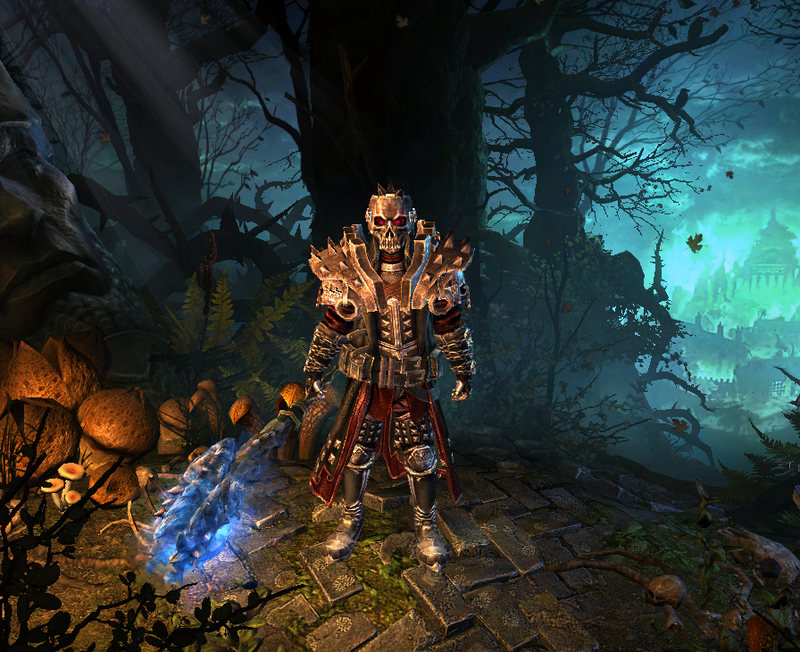 This build includes craftable items with armor bonus (Warborn Visor, Mark of Kalastor and Windshear Greaves). Always try to craft items with armor. After completing Bull you must remove the Primordial node from crossroads at the spirit guide. Also you can take Ghoul earlier if you feel unsafe; in this case don't forget to remove the Chaos node from crossroads once Kraken is completed. Aleksander, Theodin and Anasteria are easily facerolled with Aetherward Oil. I think I'll include this advice in every build. Aetherward Oil is just so good in dealing with hard aetherial hitters fast. Last edited by veretragna; 01-03-2019 at 07:27 AM. This setup is so versatile, it can be used with any mastery instead of Nightblade. I think Commando is near perfect choice too. But today I'll try it with Death Knight. WB was already known to do 7 min runs on the previous patch. I'm sure DK would do so well too. Check my profile for some of my builds. Most are crucible viable, but will be adding pure campaign builds as well. This particular build is kinda special: it is well rounded to not need any additional support or resistances from other classes, so anyone using this build can take WB, Commando, DK, even battlemage and play with comfort. Taking WB or DK will make it perform even faster. Great build, added to my thread. Hi vere, very interesting build: how would a DK version of this look like in your opinion? DK should get Spectral Binding + Spectral Wrath maxed, Mark of Torment, Soul Harvest and maybe Reaping Strike. That's it, DK needs no more. Last edited by veretragna; 12-27-2018 at 12:16 PM. I made appropriate tests yesterday and now the list of optimal combinations for this build is ready.